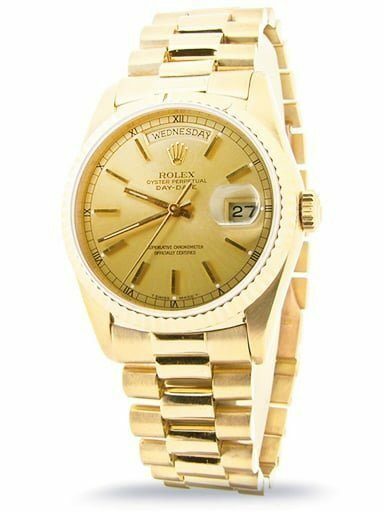 We are proud to offer a wide selection of Rolex President mens yellow gold 18K watches. Our collection comes with an assortment of colorful dials. 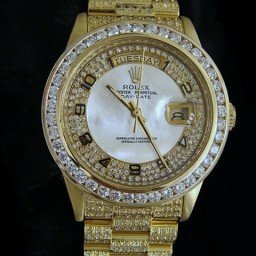 Also, you can choose from a variety of 18K yellow gold bezels and Presidential bands with full diamond options. Either way, we are confident you will find a mens yellow gold President for your style and budget. 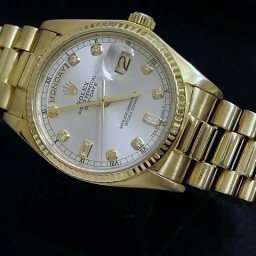 Now you can own a gold Rolex President, but at a preowned Rolex price. Keep in mind, we offer a 30-day money-back guarantee, free U.S. shipping, and available financing. In addition, our Lifetime TradeUp Guarantee Program provides further value on qualified items. So, please let us know if we can help you find your perfect watch. 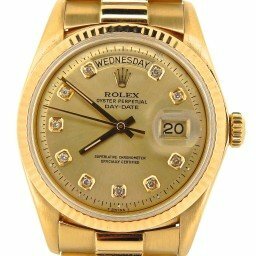 The mens Rolex President yellow gold watch is perhaps the most classic of luxury timepieces. And, the 36mm Oyster Case is the most prevalent, traditional model. However, it is also one of the most varied with a wide assortment of design details and technical specs from which to choose. 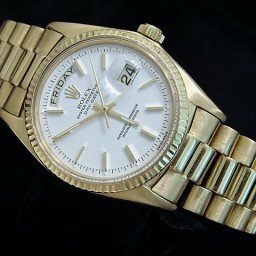 Why a PreOwned Rolex Watch? Each day, the world moves faster, it is one of the certain things about modern living. So, in this fast-paced lifestyle, what is considered luxurious? For many, luxury is having time and the ability to carve your own path. Luxury can be considered living life on your own terms, on your own time. 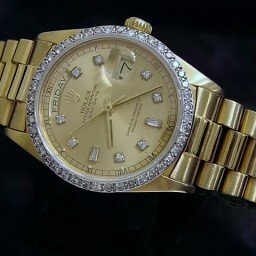 If you find these words be true, then you need the right luxurious instrument to measure time, such as a Rolex President mens yellow gold prestigious timepiece. 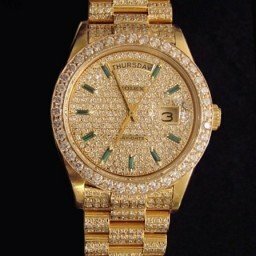 However utilitarian as your style might be, there are basic facts about luxury watches you need to know in order to make the right decision about which type you want. 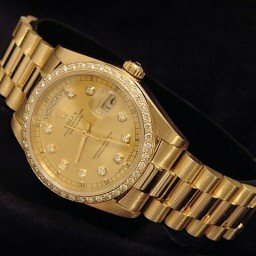 So take these factual tidbits into account when searching for your luxury watch. True luxury watches are timeless. 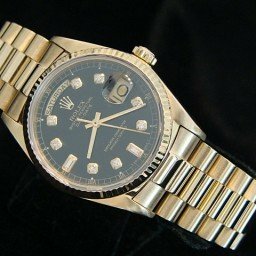 Plus, a preowned Rolex watch adds prestige and value at a more affordable Rolex price. In fact, depending on your lifestyle, a luxury watch can be considered a necessity, a staple that you wear every day. A luxury watch, whether it’s a Rolex, Tag Heuer or Patek Phillipe, serves as a symbol of distinctive taste and prestige. In our image-conscious world, these are qualities that can go a long way both personally, as well as professionally. Regardless what profession you are in, image matters. And, a luxury watch offers an unworded business card that conveys this status. Buying from reputable watch dealers ensures that your luxury watch retains, if not increases, its value with proper maintenance and care. Certain watch brands flood the market with a myriad of models and lines. however, notable brands keep production numbers low and choose instead to focus on their exquisite quality. 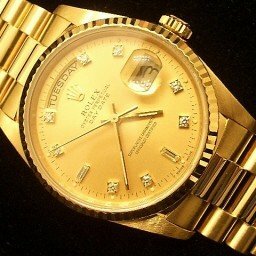 Also, don’t forget the differences in precision and engineering preowned luxury Rolex watches have over other brands. It is difficult to find another moderately-priced watch that will run flawlessly for a lifetime. 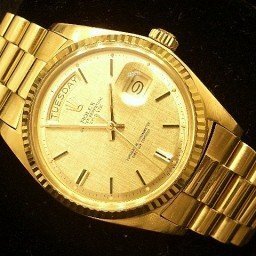 Luxury Rolex watches are meticulously crafted to a level of excellence. This ensures they become a true heirloom you can pass down to future generations. 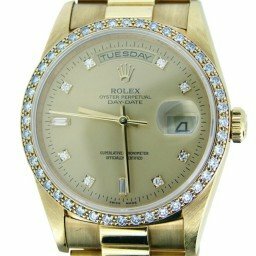 We welcome you to view a great selection of gold Rolex President Day Date watches or other luxury timepieces here at BeckerTime. 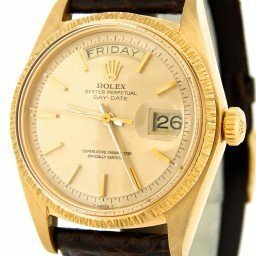 In 1956, Rolex unveiled their most expensive model to date. 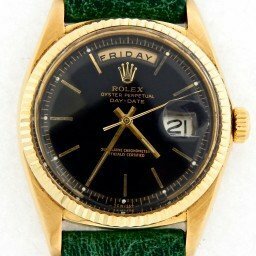 Named the Day Date— and later known as the Rolex President—this became the quintessential luxury watch for the movers and shakers of the world. While today, the Day Date is available in three shades of gold in addition to platinum, the inaugural model, ref. 6511, was crafted in 18k yellow gold. From its 36mm Oyster case to its then-new President bracelet, the Day Date was proudly dressed in solid yellow gold. 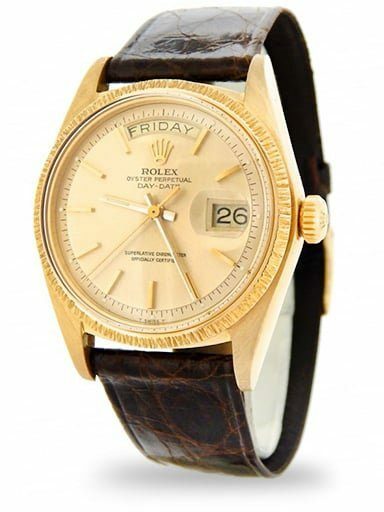 Over 60 years later, the yellow gold Rolex President Day Date remains the most popular option among the collection. You can’t argue with a classic! 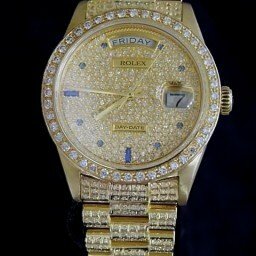 Let’s take a closer look at some options available within the yellow gold Rolex Day Date President collection. 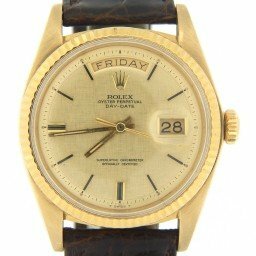 As its moniker alludes, the Rolex Day Date includes two windows on the dial to indicate the day of the week (written in full) in addition to the date of the month. In fact, the Day Date was the first wristwatch to include this practical pair of apertures. As with all Rolex collections, the Swiss watchmaker was always looking to improve functionality and technical features. 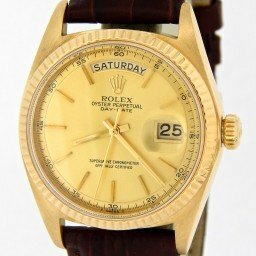 So in 1972, Rolex includes the “hacking” feature to the Day Date. This feature halts the seconds hand when the crown is pulled out for more accurate time setting. 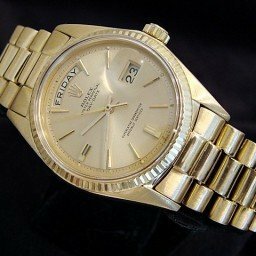 In 1978, Rolex introduces the quickset date function to the Rolex yellow gold Day Date ref. 18038, where the date adjusts independently from the hour hands. 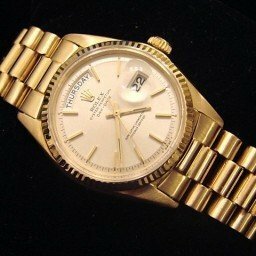 Finally, in 1988, the Rolex President ref. 18238 includes the double quickset feature, where both the day and date are autonomous from the hour hands. In 2000, the ref. 118238 debuts with identical functionality and the same movement as its predecessor, but with a heavier and improved bracelet. 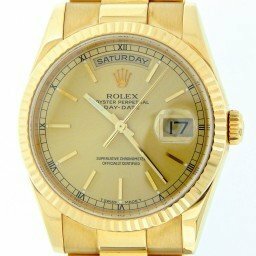 This is the current reference of the mens Rolex Gold Day Date President 118238. On a side note, the Day Date is not only available with a mechanical movement, but there are ones powered by a Rolex in-house quartz movement too. 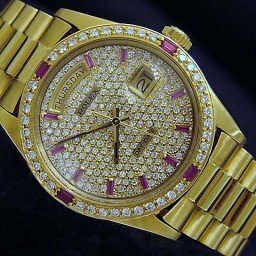 The white and yellow gold Oysterquartz Day Date models began production in the 1970s and ran through the 1990s. 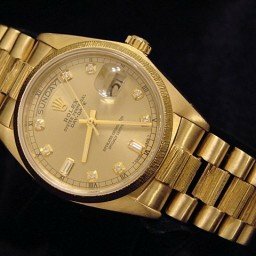 The Rolex yellow gold Day Date has a colorful history thanks to the varied choice of dials. 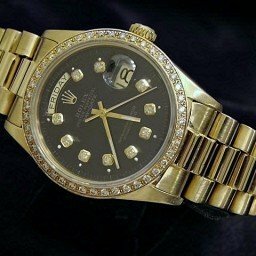 While there are certainly the classics like champagne, silver, black, and white, Rolex also offers plenty of colorful dials and interesting dial materials. Take for example the “Stella” dials of the 1970s and 1980s. Made up of multiple layers of lacquer, these vibrant dials include shades like turquoise, pink, orange, green, and others. There are also the hard stone dials like tiger’s eye, lapis lazuli, onyx, marble, and more. 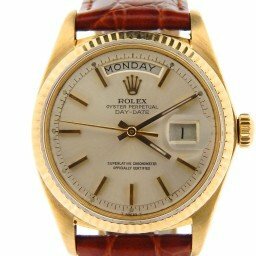 Plus, in the eighties, there were wooden dials available on the yellow gold Day Date including mahogany, walnut, and birch burl. 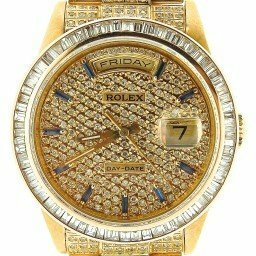 In addition to the appealing materials listed above, there are also Rolex President metal dials with attractive patterns such as honeycomb, hobnail, or linear. 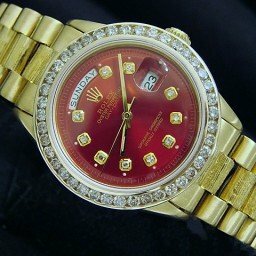 For ultra precious models, there are plenty gem versions of the yellow gold Rolex Day Date President, which range from diamond hour markers to full pavé diamond settings. 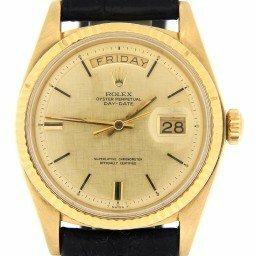 Although the 36mm size of the yellow gold Day Date President is the traditional, therefore most prevalent model, there are other sizes available too. In 2008, Rolex presented the Day Date II collection with larger 41mm Oyster cases. The Day Date II ref. 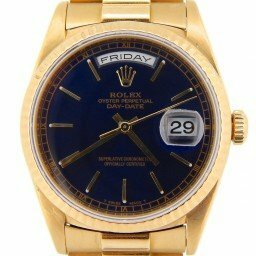 218238 models are the yellow gold editions of these bigger Rolex President watches. Only a few years later, Rolex discontinued the Day Date II line to make way for the slimmed down Day Date 40 with—you guessed it—a 40mm Oyster case. The Day Date 40 ref. 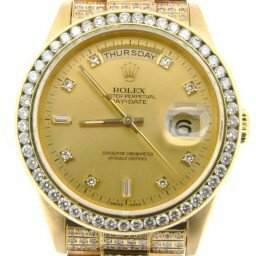 228238 watches are the versions in yellow gold.